Last week Wednesday I went to the Museum of Moving Image in Astoria Queens to see the "What's Up, Doc? 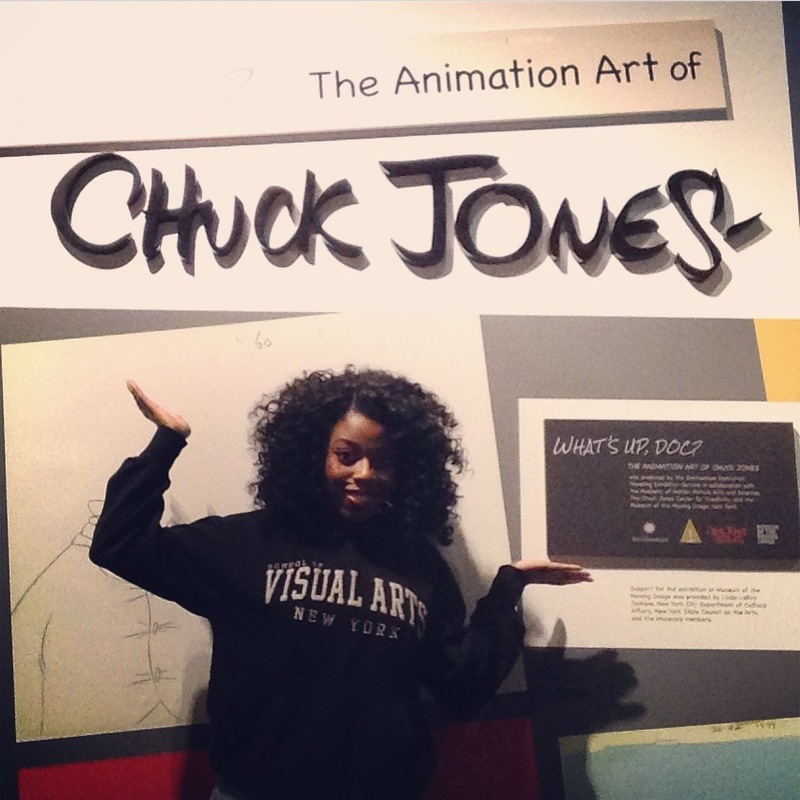 The Animation Art of Chuck Jones" before it left NYC to head to Texas for the next leg of its national 13 city tour. The exhibit arrived at MoMI on July 19,2014 and is now on its way to Fort Worth, Texas. The tour was organized by the Smithsonian Institution Traveling Exhibition Service. 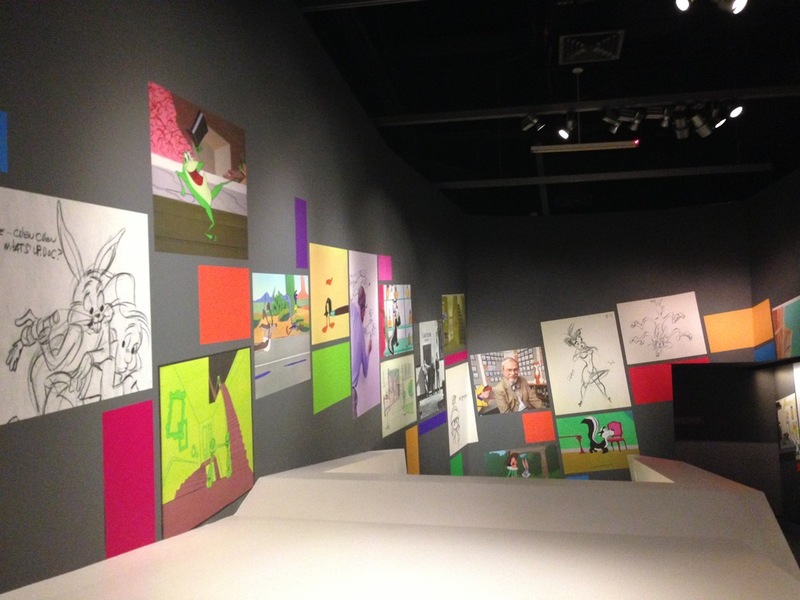 As stated on MoMI's website; "The exhibition features 23 of Chuck Jones' animated films, interactive experiences and 134 original sketches and drawings, storyboards, production backgrounds, animation cells, and photographs, demonstrating how Jones and his collaborators worked together to create some of the greatest cartoons ever made." Originally as I typed this post I felt as if I was writing a "History of Chuck Jones" paper and completely scratched it. 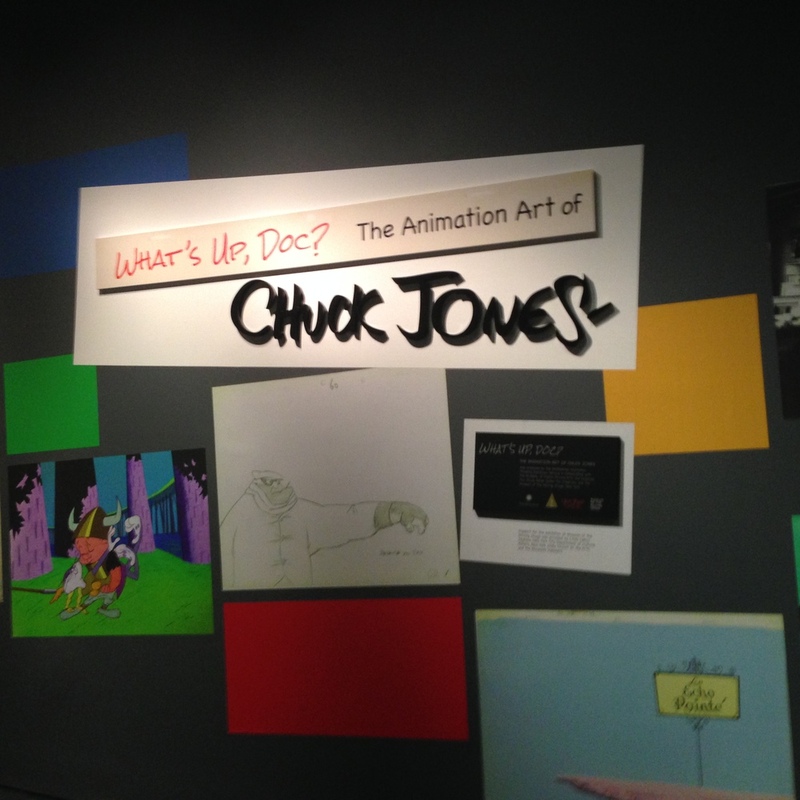 This Chuck Jones exhibit was extremely important to me. I remember being a little girl watching many Bugs Bunny and Looney Tunes cartoons as my mother braided my hair before bedtime. In elementary school Bugs Bunny was one of the first character I learned how to draw and I drew him everywhere. So as you can imagine having the opportunity to see the artwork behind such iconic characters and to learn about the artist/animator that helped to shape Bugs Bunny, Daffy Duck Porky Pig and many others into the characters we know today was fulfilling. I really enjoyed seeing the background art from the 1953 "Bully For Bugs" cartoon as well as the many character sheets of Michigan J. Frog, The Grinch and Horton from Horton Hears A Who. I found it interesting that Jones had a specific set of rules for Wile E. Coyote and the Road Runner such as "No outside force can harm the coyote—only his own ineptitude or the failure of Acme products" or how the Road Runner is never to be seen running on anything other than the road. The exhibit had an area where they screened "One Froggy Evening", "Beep Beep", "Duck Amuck", "The Dot and The Line" and "How The Grinch Stole Christmas" with introductory remarks to each selection by John Lasseter. I have seen everyone except "The Dot and The Line" so I sat and watched it. I felt that it's simplicity was humbling. It is a story of unrequited love between geometry but it was told in such a way that made it extremely enjoyable. Story aside the way the geometry interacted with themselves and the way he used color definitely aided to how successful this short was. 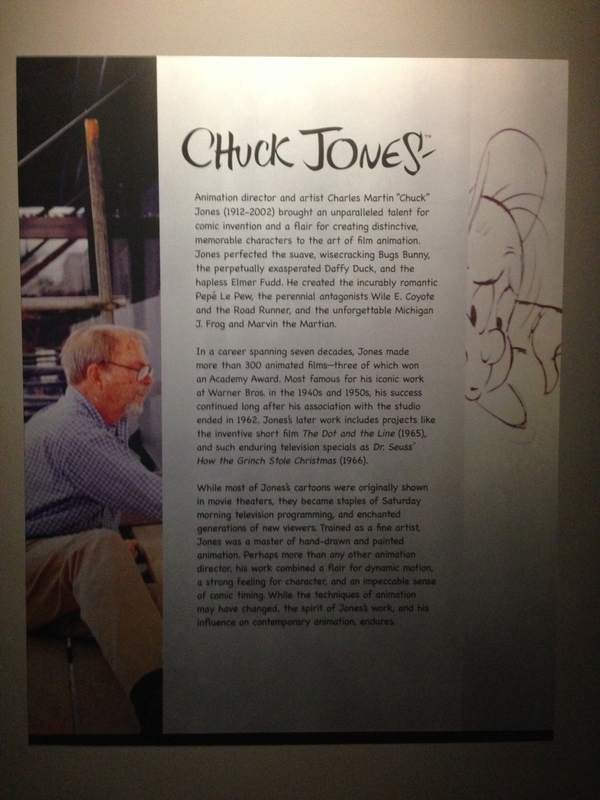 Over all, I learned so much more about Chuck Jones and simply for the sake out of not wanting to writing a paper on him I've spared you all some of those facts (which I'm sure you can find online). I will leave with you some motivational words from Mr. Chuck Jones. "All worthwhile endeavors are 90% work and 10% love and only the love should show."